I know a guy that's a sucker for rugelach. It's his favorite cookie in the entire world. His love and delight at the prospect of finding a great rugelach cookie in Los Angeles inspired me to make my own. After looking through various cookbooks, mostly Jewish in nature, I remembered seeing this recipe in the Smitten Kitchen Cookbook, by Deb Perelman. If you aren't familiar with Smitten Kitchen, change your culinary life and subscribe to the site. I am constantly humbled by the excellence of Deb's posts, ideas, recipes, and meticulous attention to detail. I regularly use the cookbook as a source of inspiration. These cookies are so ridiculously perfect in texture and taste, and so beautiful to look at, that when you share them with friends and family they will start to think of you as a master baker. Admittedly, the cookies are a little fussy to make. There are multiple steps, but none of those steps are hard. Plan to make these cookies when you have some time on your hands. If you're a rugleach lover, look no further. No store bought version will compare to these flaky, tender, jammy, chocolatey cookies. In the bowl of an electric mixer, beat the butter and cream cheese together until they are light and fluffy. In a medium bowl, combine the salt and flour, then pour the flour mixture into the mixer. Beat on a lower speed until the flour just disappears. Scrape the dough onto a large piece of plastic wrap and shape as best you can into a flattish packet (you will later divide the dough into thirds, so keep that in mind). Wrap the dough in the plastic wrap, and chill in the fridge for two hours or up to three days. Line three large baking sheets with parchment paper. Heat your jam in a small saucepan until it just simmers. This will make the jam easier to spread. In a small dish, stir together your sugar and cinnamon, set aside. Add the chocolate chips to a small dish and set aside. Whisk together the egg and water in a small bowl and set aside. Make sure you have your coarse sugar readily available. Take out a rolling pin, small spatula for spreading the jam, flour for the counter, spoons for the dry toppings, and a pastry brush for the egg wash.
Divide your chilled dough into thirds. On a well-floured counter, roll the first third of dough into a large thin circle about 12 inches in diameter (keep the remaining dough in the fridge to keep it cool). Don't worry about rolling out a perfect circle, or about trimming the edges. Spread 2-3 tablespoons of the jam thinly over your dough. If you use 3 tablespoons of jam, some of it will ooze out during the baking process, and it will get just a little burnt. I prefer using extra jam. If desire a cleaner cookie, go with 2 tablespoons of the jam. Sprinkle 3 tablespoons of cinnamon sugar, 2 tablespoons of chocolate chips, and nuts if you're using them over the dough. Gently press the toppings into the dough. As you can see, it's hardly perfect, and it hardly matters. Roll each wedge tightly from the outside to the center. Transfer the rugelach to the parchment-lined baking sheet. Spread them about 1 inch apart. Pop the tray in the freezer for 15 minutes before baking (I didn't do this and it didn't seem to matter). Before baking, brush the cookies with the egg wash, and then sprinkle the coarse sugar on top. 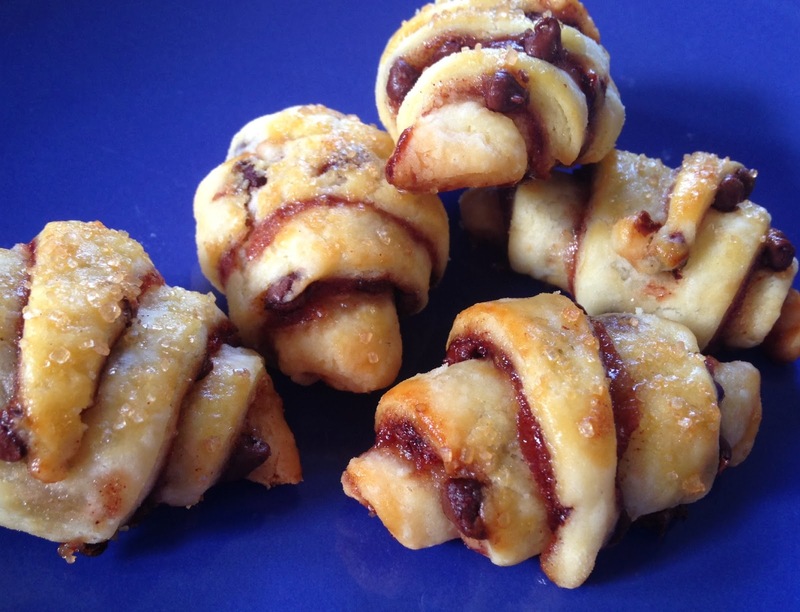 Bake the rugelach for 20-25 minutes until they are puffed and golden brown. Transfer the rugelach to cooling racks while they are still hot, otherwise the jam will harden and they can get stuck on the parchment paper. Served cooled or lukewarm.